Download "UST Regulatory Compliance Inspection Training. 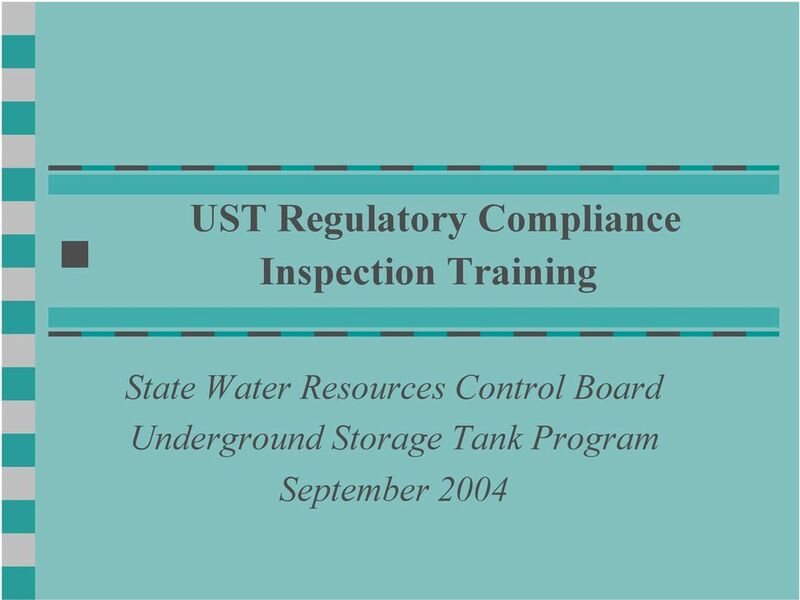 State Water Resources Control Board Underground Storage Tank Program September 2004"
2 Disclaimer The material provided herein is not comprehensive of Chapter 6.7, California Health and Safety Code or Title 23, California Code of Regulations. 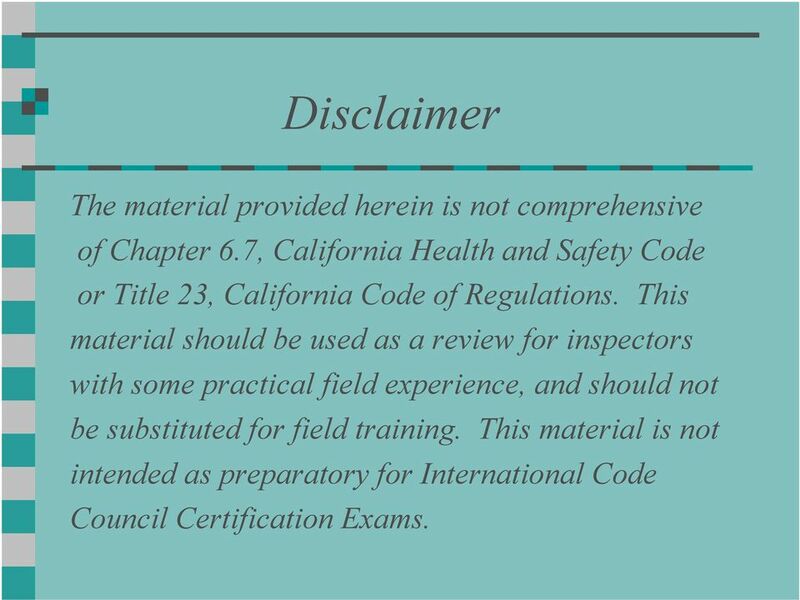 This material should be used as a review for inspectors with some practical field experience, and should not be substituted for field training. This material is not intended as preparatory for International Code Council Certification Exams. 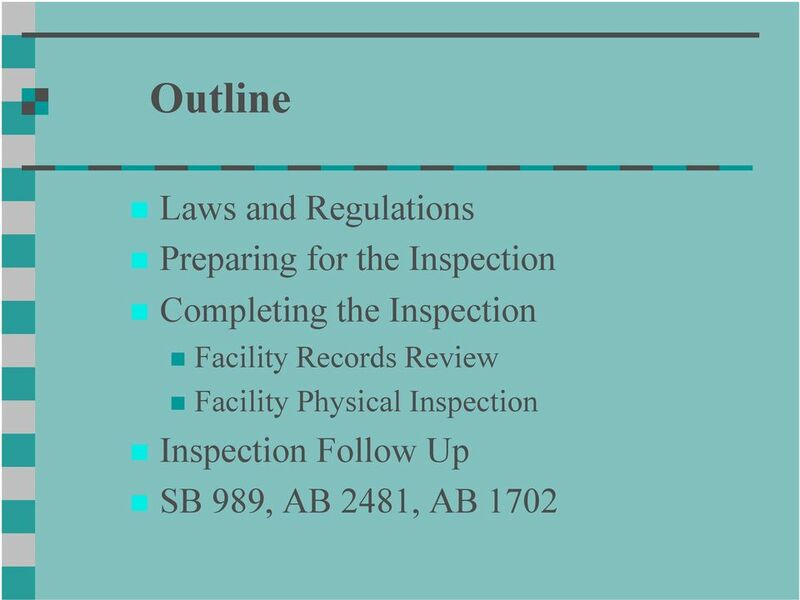 23 Inspection Frequency The HSC requires UST facilities be inspected annually. 79 Summary 1 of Training Requirements for Underground Storage Tank (UST) Professionals (California Code of Regulations, Title 23, Chapter 16) UST OWNER CITATION New Requirements: Submit a signed statement to the local agency by January 1, 2005, which includes 2 : 2715(a) Owner understands and is in compliance with all applicable UST requirements. Owner notifies the local agency of the Designated UST Operator for each facility owned. DESIGNATED UST OPERATOR New Requirements: Possess a current California UST System Operator certification issued by the International 2715(b) Code Council (ICC) by January 1, Certification must be renewed every 24 months. Provide annual on-the-job training for facility employee(s). Initial training required by 2715(f) July 1, Facility employees hired on or after July 1, 2005 must complete initial training within 30 days of the date of hire. Perform monthly visual inspections and record results on an inspection report, which must be 2715(c)&(d) provided to the owner/operator. UST SERVICE TECHNICIAN Secondary Containment Testing Existing Requirement: Possess a current Tank Testers License or appropriate Contractors State License Board 2637(d) (CSLB) license 3. New Requirements: Obtain training and certification through the developer of the testing equipment or test 2715(i)(2)&(3) method being used, or through the manufacturer of the secondary containment component being tested. Recertification is required at the time interval recommended by the manufacturer, or every 36 months, whichever is shorter. 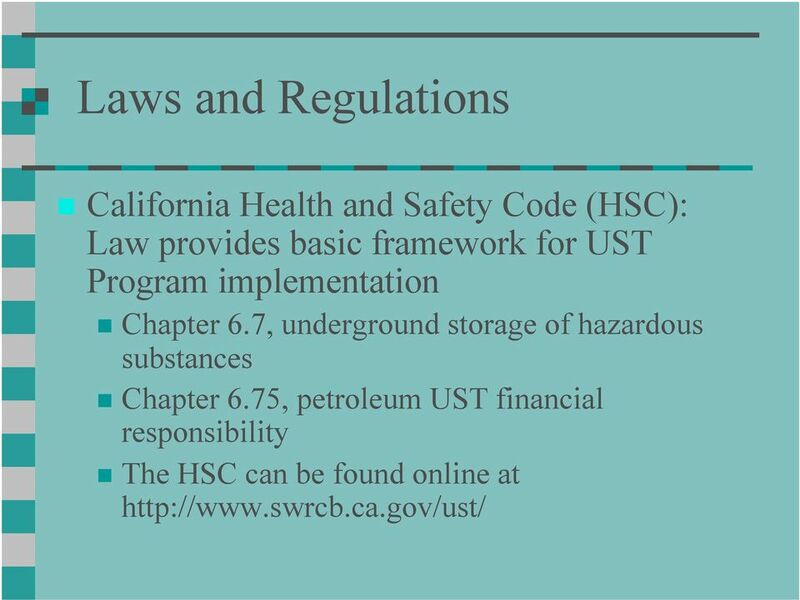 Possess or work under the direct and personal supervision of an individual physically present 2715(i)(4) at the work site who possesses a current California UST Service Technician certification issued by the ICC by July 1, Certification must be renewed every 24 months. Annual Monitoring Equipment Certification Existing Requirements: Possess a current Tank Testers License or appropriate CSLB license. 2638(b) Obtain training and certification from the monitoring equipment manufacturer and be 2715(i)(2)&(3) recertified at the time interval recommended by the manufacturer, or every 36 months, whichever is shorter. New Requirement: Possess or work under the direct and personal supervision of an individual physically present 2715(i)(4) at the work site who possesses a current California UST Service Technician certification issued by the ICC by July 1, Certification must be renewed every 24 months. 1 This is a summary table and does not present comprehensive information on the training requirements. 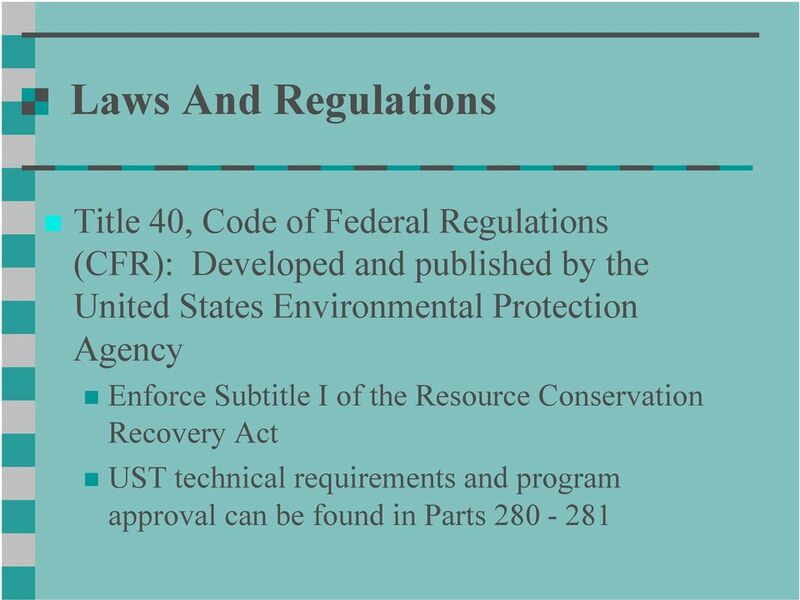 Please refer to Title 23, California Code of Regulations for detailed information on the training requirements for UST professionals. A copy of the UST regulations is available online at: The owner must inform the local agency of any change of designated UST operator(s) no later than 30 days after the change. 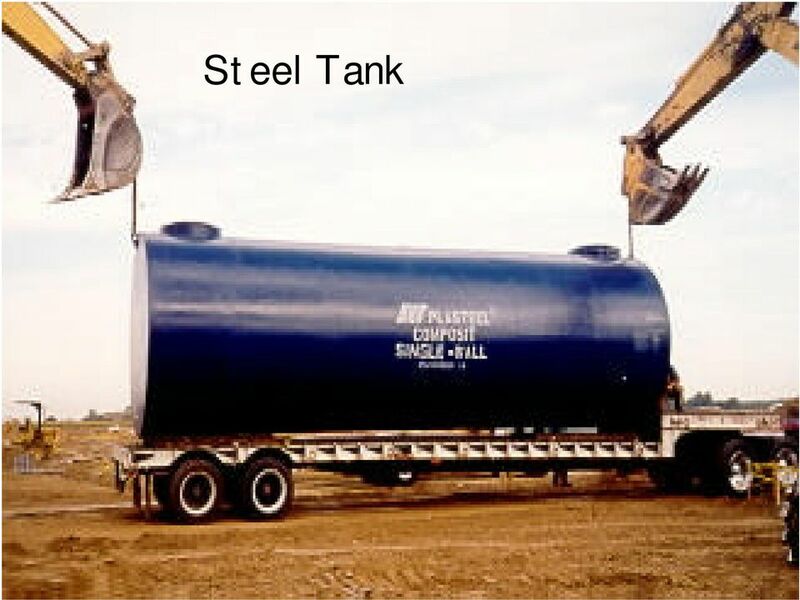 A Tank Tester License must be held by the individual performing the work. A CSLB license may be held by either the employer or the individual performing the work. 4 If the California UST Service Technician exam is not available by July 1, 2004, this requirement will become effective 12 months after the date the exam is available. 139 Following Up The Inspection Pursuing violations: Pursuing violators should be based on severity and reoccurrence of violations What is the nature of the violation? You are not likely to get backing from the DA s office for enforcement of minor things such as sloppy record-keeping and dirty sumps. Is there a potential for a real threat to public health and/or the environment? What is the violator s compliance history? Are the violations repeatedly the same? How successful was the local agency in getting the owner/operator to comply with the regulations? 141 Successful Leak Detection Program????? 144 Terms UST and UST System. 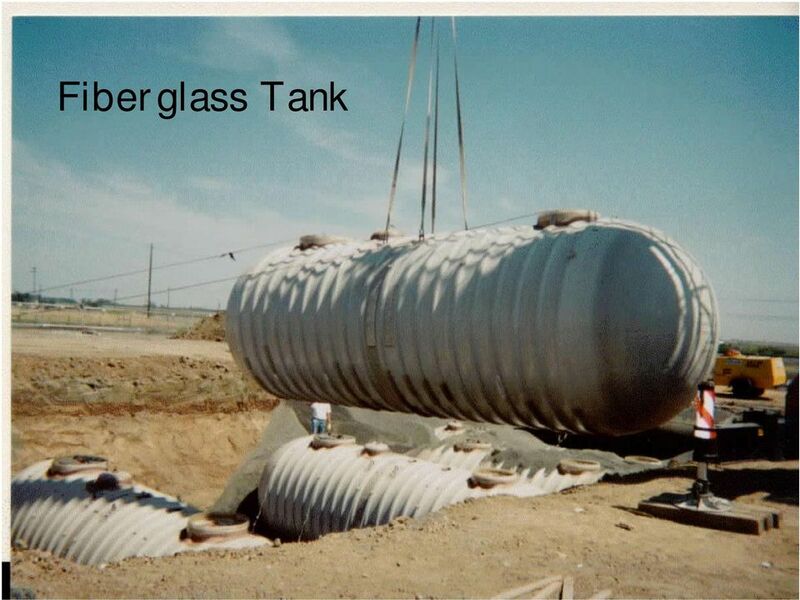 UST means tanks and piping used for the storage of a hazardous substance [H&S Code, 25281(x)(1)]. 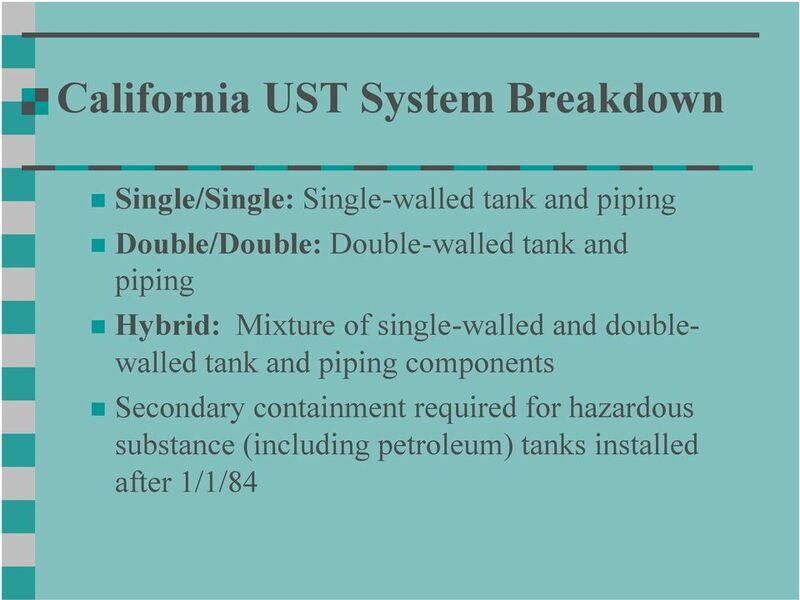 UST system means an underground storage tank, connected piping, ancillary equipment and containment systems [H&S Code, 25281(y)]. 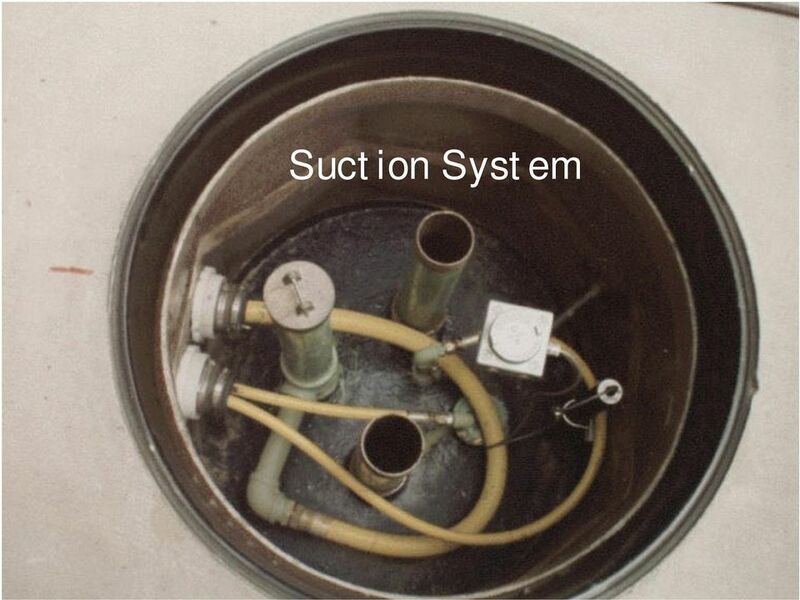 145 UST Systems Installed After July 1, 2003 Primary and secondary containment must be product tight. 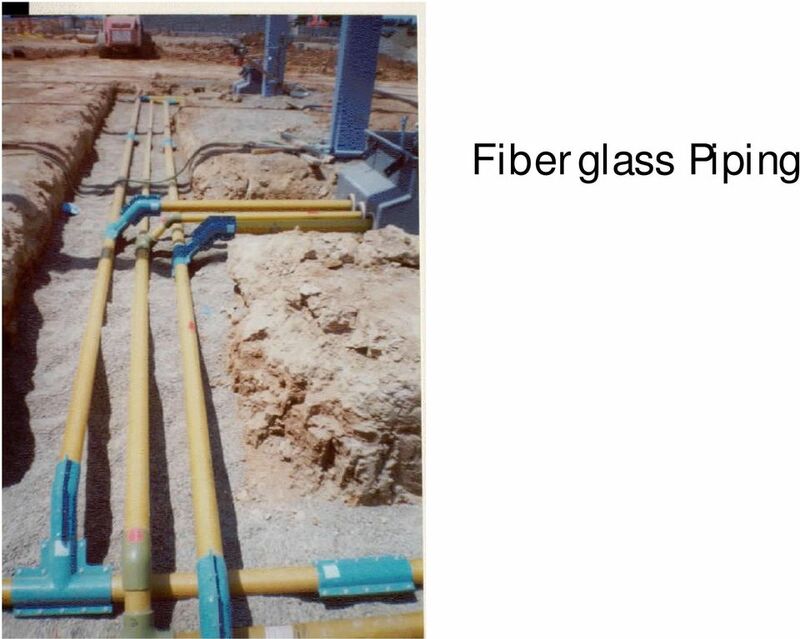 Product tight means impervious to the liquid and vapor of the stored substance, to prevent seepage from containment. 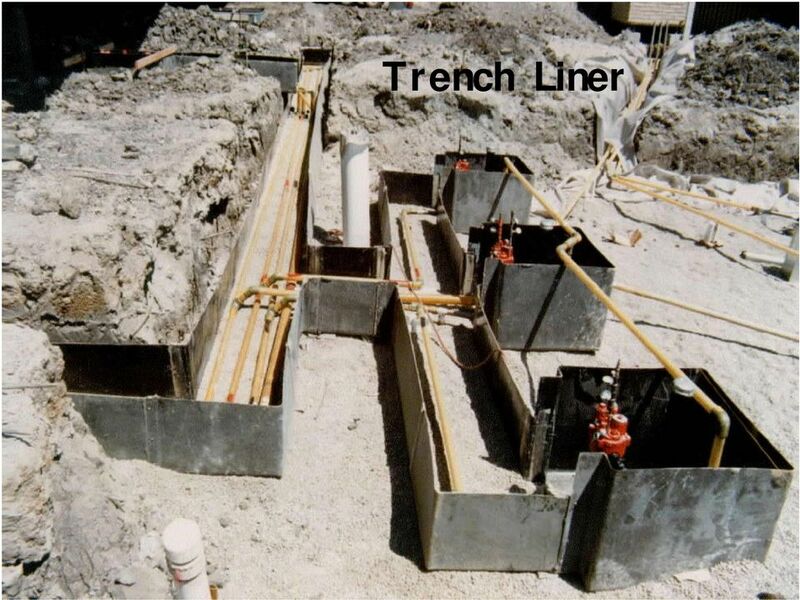 146 UST Systems Installed After July 1, 2003 Secondary containment must be constructed to prevent water intrusion into the UST system by precipitation, infiltration, or surface runoff. 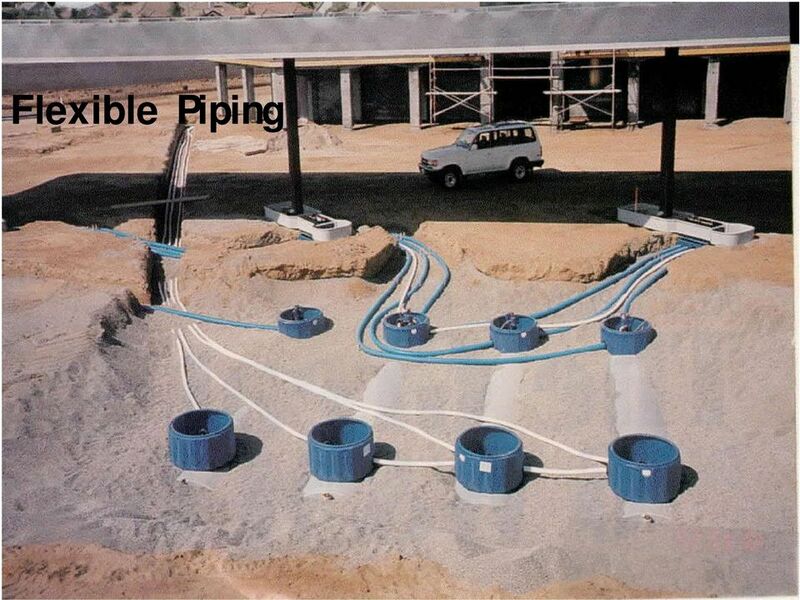 147 UST Systems Installed After July 1, 2003 Vent lines, vapor recovery lines, and fill pipes that are beneath the surface of the ground are defined as pipe and therefore part of the UST system, which means they must have secondary containment. 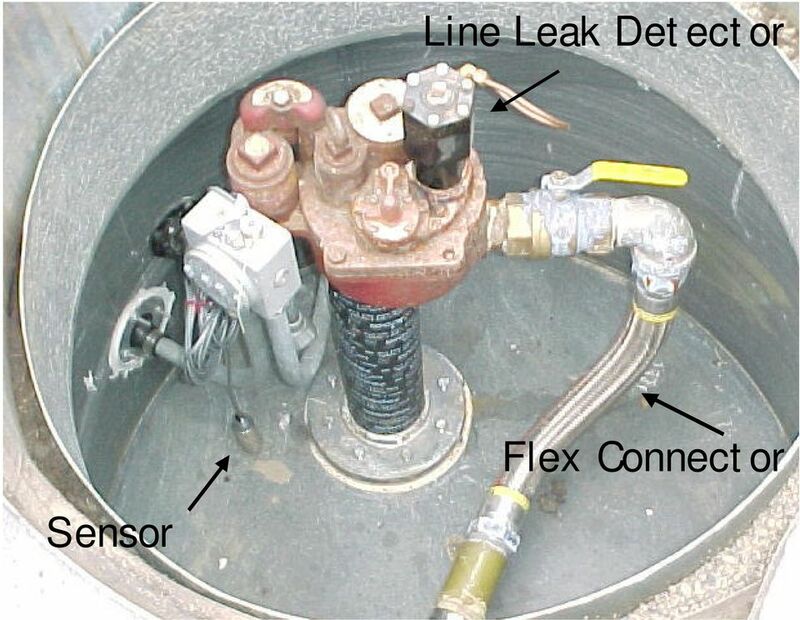 150 ELD Testing of UST Systems If results of ELD testing indicate that any component of the UST system is leaking liquid or vapor, the owner or operator must take appropriate actions to correct the leakage. 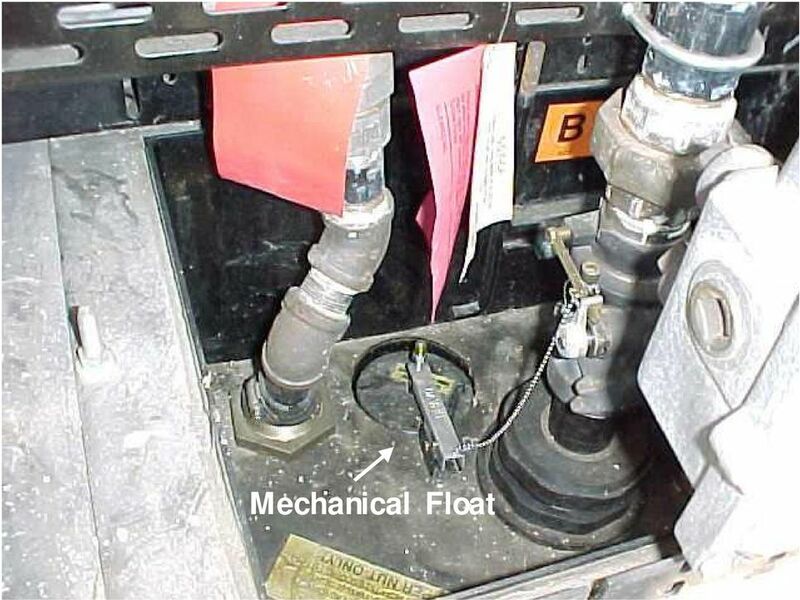 Additionally, the owner or operator must retest the UST system using ELD until the UST system is no longer leaking liquid or vapor. 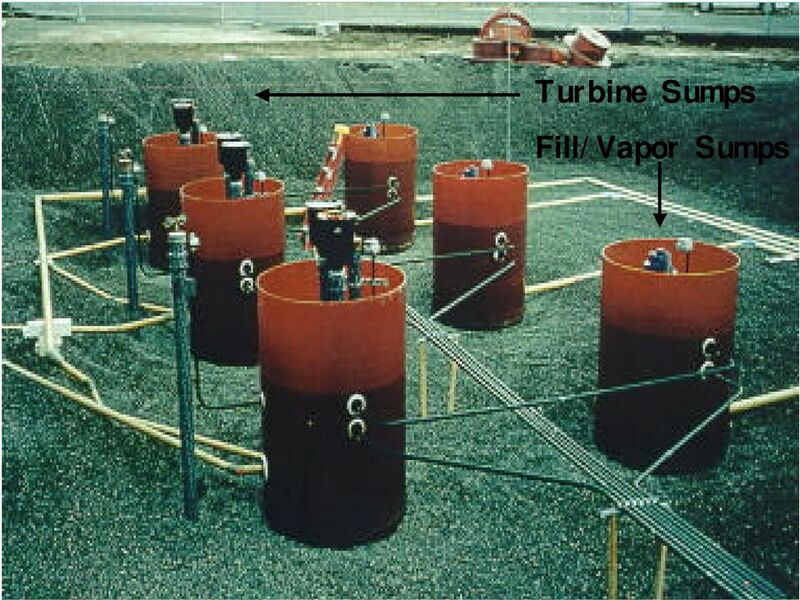 151 All UST Systems Owners/operators must annually test spill containment structure(s) designed to prevent a release in the event of a spill or overfill while a hazardous substance is being placed in the tank to show that it is capable of containing the substance until it is detected and cleaned up. 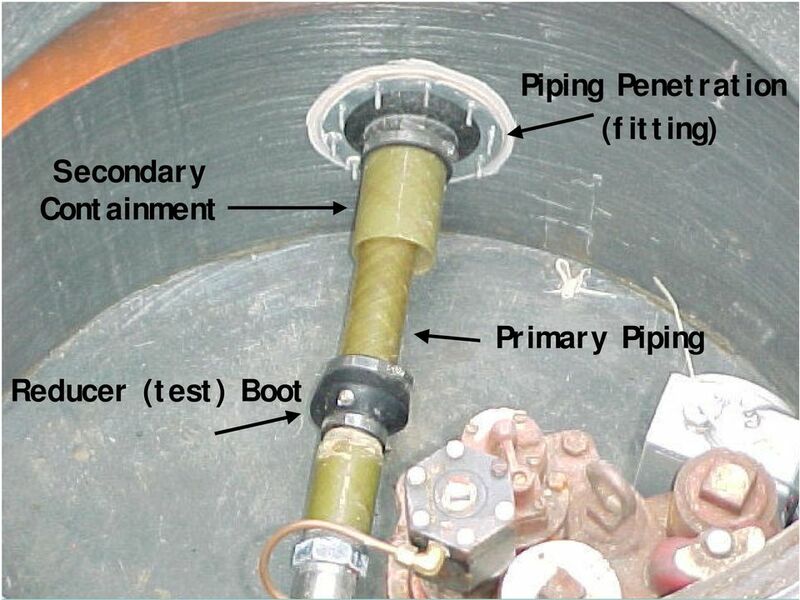 152 Tank Test Reporting Requires a tank tester who conducts or supervises a tank or piping integrity test to prepare a report detailing the results of the tank test and to maintain a record of the report for at least three years, in a specified manner. Tank testers must sign these reports with an original signature under penalty of perjury. Additionally, a tank tester must type or print his or her name and license number on the report. 153 Diesel Emergency Generator Tank (EGT) Systems EGT system means a UST system that provides power supply in the event of a commercial power failure, stores diesel fuel, and is used solely in connection with an emergency system, legally required standby system, or optional standby system, as defined in the Articles 700, 701, and 702 of the National Electrical Code of the National Fire Protection Association. 154 Diesel Emergency Generator Tank (EGT) Systems Any tank or piping that is part of an EGT system located in a structure as described in the H&S Code is exempt from secondary containment testing if visual inspections of the tank or piping are conducted each time the tank system is operated, but no less than monthly. 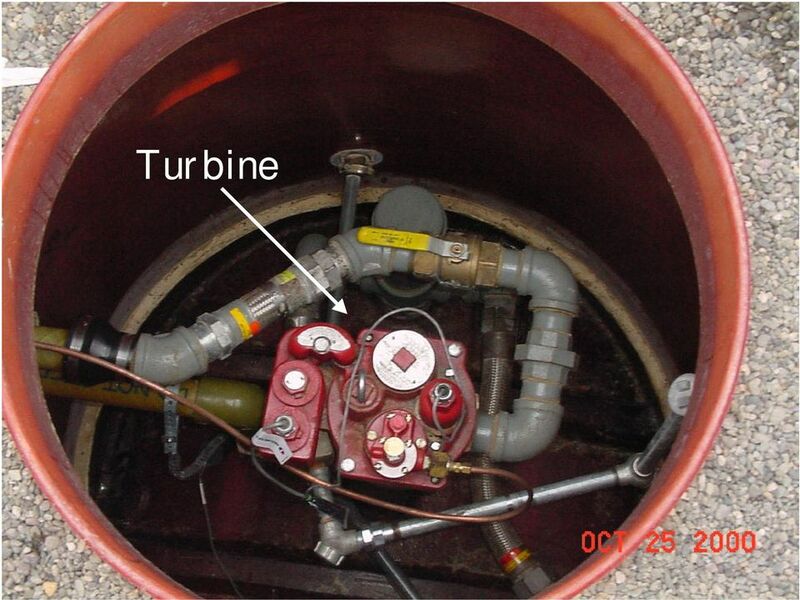 155 Diesel Emergency Generator Tank (EGT) Systems Unburied fuel piping connected to an EGT system is excluded from the definition of UST, if the owner or operator conducts visual inspections of the piping each time the system is operated, but no less than monthly. This exclusion does not apply if the SWRCB adopts specific regulations relative to EGT systems. 156 Diesel Emergency Generator Tank (EGT) Systems Secondary containment components that are part of an EGT system may be tested using ELD if the test is performed at the frequency specified by the SWRCB secondary containment testing regulations. 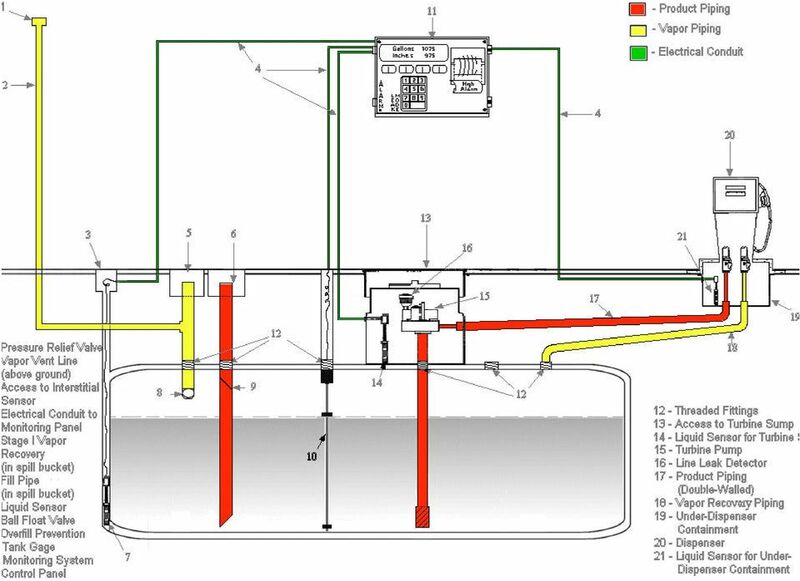 157 Diesel Emergency Generator Tank (EGT) Systems If results of ELD testing indicate that any component of the UST system is leaking liquid or vapor, the owner or operator must take appropriate actions to correct the leakage. Additionally, the owner or operator must retest the UST system using ELD until the UST system is no longer leaking liquid or vapor. 158 Red Tag & Administrative Enforcement Order (AEO) Authority Deletes requirement for an upgrade certificate of compliance and substitutes red tag authority. 159 Red Tag & AEO Authority A local agency may, upon the discovery of a significant violation that poses an imminent threat to human health, safety, or the environment, immediately affix a red tag to the fill pipe to provide notice that the delivery of petroleum into the UST system is prohibited. 160 Red Tag & AEO Authority If a local agency discovers a significant violation that does not pose an imminent threat, the local agency may issue a notice of significant violation to the owner or operator. The owner or operator must within seven days correct the violation. 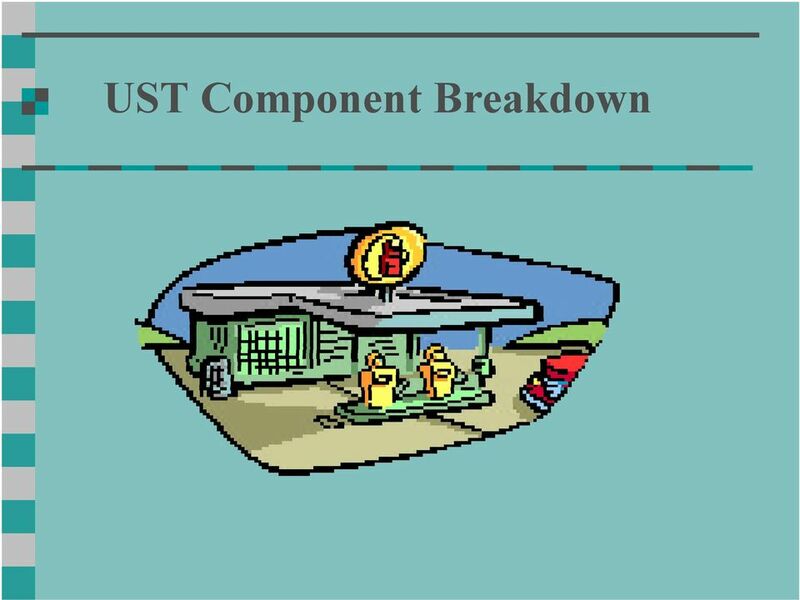 If the owner or operator fails to correct the violation to the satisfaction of the local agency, the local agency may affix a red tag to the fill pipe to provide notice that the delivery of petroleum into the UST system is prohibited. 161 Red Tag & AEO Authority Upon notification by the owner that a violation has been corrected, the local agency must re-inspect the UST system within 5 days to determine whether the system continues to be in significant violation. If the local agency determines that the violation has been corrected, the local agency must immediately remove the red tag. 162 Red Tag & AEO Authority Prohibits any person from depositing petroleum into an UST system that has a red tag affixed to its fill pipe. Requires the SWRCB to adopt regulations defining significant violation." 163 Red Tag & AEO Authority Authorizes Unified Program Agencies to issue AEOs requiring that violations be corrected and to impose an administrative penalty. The law specifies procedures for conducting a hearing, upon the request of a person served with an order. 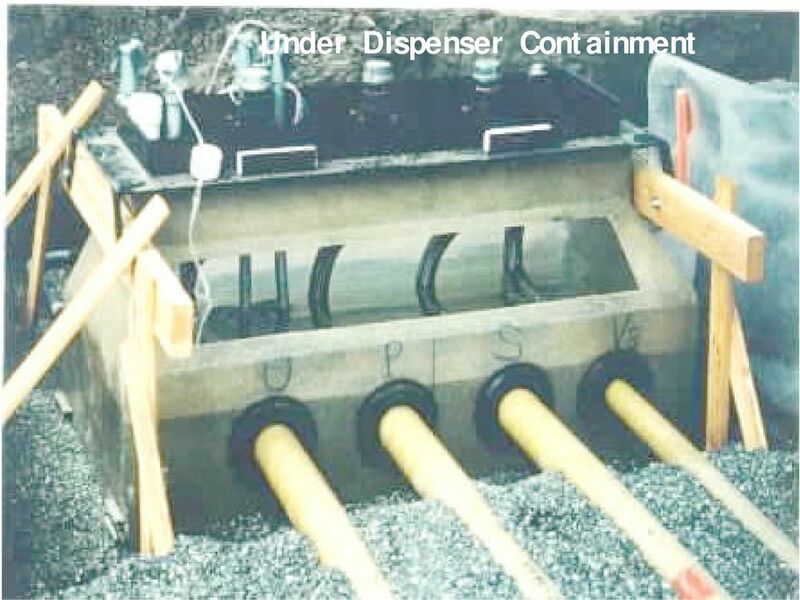 165 UST Systems Installed After July 1, 2004 The UST system must be designed and constructed with a continuous monitoring system capable of (1) detecting entry of the liquid or vapor-phase substance stored in the primary containment into the secondary containment and (2) detecting water intrusion into the secondary containment. STATE OF RHODE ISLAND AND PROVIDENCE PLANTATIONS DEPARTMENT OF ENVIRONMENTAL MANAGEMENT OFFICE OF COMPLIANCE & INSPECTION IN RE: Rhode Island Convention Center Authority FILE NO. : UST 2015-27-03413 A.